I like Frank Lloyd Wright lighting projects and wanted to make Taliesin floor lamp for a long time. Thanks for the help H Reynolds and his project Hillside lamp http://lumberjocks.com/projects/27536. I decided to make shades and boxes are removable for the handy change lamps. I used 1/4 ” plywood for the shades and then veener sapele (1 side) and ash ( 2 side). The base and boxes are made from sapele . I decided to add Greene and Greene accents for the boxes ( ebony plugs and traditional G&G joints). I used 10 LED lamps 3W and ceramic lamp-sockets. Finishing is red mahagony gel stain, oil and beesewax. Beautiful Work! Mr. Wright would be Proud! -- Ireland, Galway .... fingers! "we dont sell them"
Very nice! That looks like a lot of repetative processing there. Way to stick with it. Great piece I love FLW inspired work. He was the bomb. I have never seen anything like it! Awesome lamp and incredible details. Fantastic work! Looks better than the original! You say you made the boxes and shades removable, are they a friction fit or is there some type of fastener used? Thanks everyone. Boxes and shades are friction fit. I tried to make permissible clearance 1/64”-1/32” max. The depth of the grooves is 1/4”. This sizes of the grooves and clearances ensure good fit for the boxes and shades. To Rick. Thank you for the question about small river. 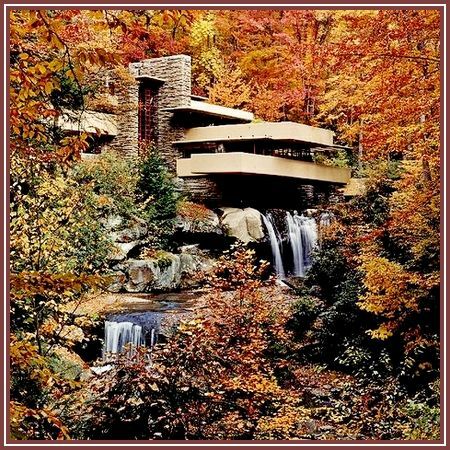 It help me to know about the most uniqe home in the world – Falling Water House at Bear Run, Pennsilvania. 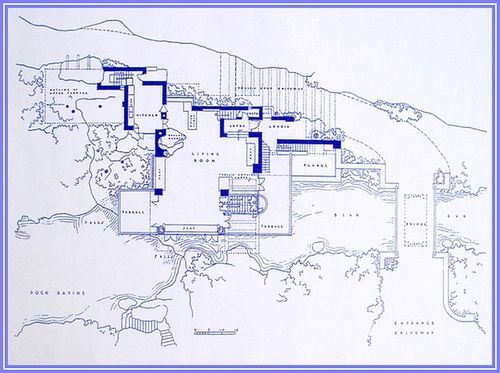 Fantastic Frank Lloyd Wright project. When I got My Degree in Architecture we had a choice of Projects to Study and do a Write up on. That Amazing Piece Of Architecture was My Topic Of Choice. Sorry About The Blueprint. I REALLY had to size it Down to get it on here. It’s actually about 4’ Long. What a Beautiful Fall Picture of a Beautiful Home!